Definition at line 48 of file mapdata.c. After shifting the virtual map: new minimum distance of the view area to the new virtual map border. Definition at line 36 of file mapdata.c. Definition at line 30 of file mapdata.c. Referenced by expand_clear_bigface(), expand_clear_face(), expand_clear_face_from_layer(), expand_need_update(), expand_need_update_from_layer(), expand_set_bigface(), expand_set_face(), mapdata_clear_old(), mapdata_clear_space(), mapdata_init(), mapdata_newmap(), mapdata_set_anim_layer(), mapdata_set_check_space(), mapdata_set_darkness(), mapdata_set_face_layer(), mapdata_set_size(), mapdata_set_smooth(), mark_resmooth(), and recenter_virtual_map_view(). Maximum size of a big face image in tiles. Larger faces will be clipped top/left. Definition at line 41 of file mapdata.c. Referenced by expand_clear_bigface(), expand_clear_face(), expand_need_update(), expand_set_bigface(), expand_set_face(), mapdata_bigface(), mapdata_get_image_size(), and recenter_virtual_map_view(). Definition at line 104 of file mapdata.c. References Map::cells, MapCell::heads, MAXLAYERS, MapCellLayer::size_x, MapCellLayer::size_y, the_map, and BigCell::x.
Referenced by mapdata_init(), mapdata_newmap(), and recenter_virtual_map_view(). Clear a face from bigfaces. x, y, and layer are the coordinates and layer of the head relative to pl_pos. w and h give the width and height of the face to clear. If set_need_update is set, all affected tiles are marked as "need_update". Definition at line 346 of file mapdata.c. References bigfaces, Map::cells, MapCellLayer::face, FOG_MAP_SIZE, BigCell::head, height, BigCell::layer, MAX_FACE_SIZE, MAX_VIEW, MAXLAYERS, MapCell::need_update, pl_pos, MapCellLayer::size_x, MapCellLayer::size_y, BigCell::tail, the_map, width, BigCell::x, PlayerPosition::x, BigCell::y, and PlayerPosition::y. Definition at line 400 of file mapdata.c. References bigfaces, expand_clear_bigface(), MapCellLayer::face, BigCell::head, BigCell::layer, MAX_VIEW, MAXLAYERS, BigCell::next, BigCell::prev, MapCellLayer::size_x, MapCellLayer::size_y, BigCell::x, and BigCell::y.
Referenced by expand_set_bigface(), mapdata_newmap(), and mapdata_scroll(). Clear a face from the_map.cells. x, y, and layer are the coordinates of the head and layer relative to pl_pos. Definition at line 213 of file mapdata.c. References MapCellLayer::animation, MapCellLayer::animation_left, MapCellLayer::animation_phase, MapCellLayer::animation_speed, Map::cells, MapCellLayer::face, FOG_MAP_SIZE, MapCell::heads, BigCell::layer, mapdata_cell(), mark_resmooth(), MAX_FACE_SIZE, MAXLAYERS, MapCell::need_resmooth, MapCell::need_update, MapCellLayer::size_x, MapCellLayer::size_y, BigCell::tail, MapCell::tails, and the_map. Definition at line 268 of file mapdata.c. References expand_clear_face(), FOG_MAP_SIZE, MapCell::heads, BigCell::layer, mapdata_cell(), MAXLAYERS, MapCellLayer::size_x, and MapCellLayer::size_y. Referenced by expand_set_face(), mapdata_animation(), mapdata_bigface(), mapdata_clear_old(), mapdata_set_anim_layer(), and mapdata_set_face_layer(). Mark a face as "need_update". x and y are the coordinates of the head relative to pl_pos. w and h is the size of the face. Definition at line 511 of file mapdata.c. References Map::cells, FOG_MAP_SIZE, MAX_FACE_SIZE, MapCell::need_update, and the_map. Definition at line 539 of file mapdata.c. References expand_need_update(), MapCellLayer::face, FOG_MAP_SIZE, BigCell::head, MapCell::heads, BigCell::layer, mapdata_cell(), MAXLAYERS, MapCellLayer::size_x, and MapCellLayer::size_y. Referenced by mapdata_clear_space(), and mapdata_set_check_space(). Update a face into bigfaces. face is the new face to set. Definition at line 446 of file mapdata.c. References bigfaces, bigfaces_head, Map::cells, expand_clear_bigface_from_layer(), MapCellLayer::face, FOG_MAP_SIZE, BigCell::head, height, BigCell::layer, mapdata_get_image_size(), MAX_FACE_SIZE, MAX_VIEW, MAXLAYERS, MapCell::need_update, BigCell::next, pl_pos, BigCell::prev, MapCellLayer::size_x, MapCellLayer::size_y, BigCell::tail, the_map, width, BigCell::x, PlayerPosition::x, BigCell::y, and PlayerPosition::y.
Referenced by mapdata_animation(), mapdata_clear_space(), mapdata_set_anim_layer(), and mapdata_set_face_layer(). Update a face into the_map.cells. face is the new face to set. if clear is set, clear this face. If not set, don't clear. the reason clear may not be set is because this is an animation update - animations must all be the same size, so when we set the data for the space, we will just overwrite the old data. Problem with clearing is that clobbers the animation data. Definition at line 295 of file mapdata.c. References Map::cells, expand_clear_face_from_layer(), MapCellLayer::face, FOG_MAP_SIZE, MapCell::heads, BigCell::layer, mapdata_cell(), mapdata_get_image_size(), mark_resmooth(), MAX_FACE_SIZE, MAXLAYERS, MapCell::need_update, MapCellLayer::size_x, MapCellLayer::size_y, BigCell::tail, MapCell::tails, and the_map. Referenced by mapdata_animation(), mapdata_set_anim_layer(), and mapdata_set_face_layer(). Return the size of a face in tiles. The returned size is at between 1 and MAX_FACE_SIZE (inclusive). Definition at line 1320 of file mapdata.c. Referenced by expand_set_bigface(), and expand_set_face(). Check if the given map tile is a valid slot in the map array. Definition at line 1002 of file mapdata.c. References height, MAXLAYERS, and width. Referenced by mapdata_bigface(), mapdata_bigface_head(), and mapdata_face(). Definition at line 192 of file mapdata.c. References Map::cells, FOG_MAP_SIZE, mapdata_cell(), MapCell::need_resmooth, MapCell::smooth, and the_map. Referenced by expand_clear_face(), and expand_set_face(). Check if current map position is out of bounds if shifted by (dx, dy). If so, shift the virtual map so that the map view is within bounds again. Assures that [pl_pos.x-MAX_FACE_SIZE..pl_pos.x+MAX_VIEW+1] is within the bounds of the virtual map area. This covers the area a map1a command may affect plus a one tile border. Definition at line 1163 of file mapdata.c. References Map::cells, clear_cells(), FOG_BORDER_MIN, FOG_MAP_SIZE, height, MAX_FACE_SIZE, MAX_VIEW, pl_pos, the_map, width, PlayerPosition::x, and PlayerPosition::y.
Update darkness information. This function is called whenever a map1a command from the server was received. x and y are absolute coordinates into the_map.cells. darkness is the new darkness value. Definition at line 160 of file mapdata.c. 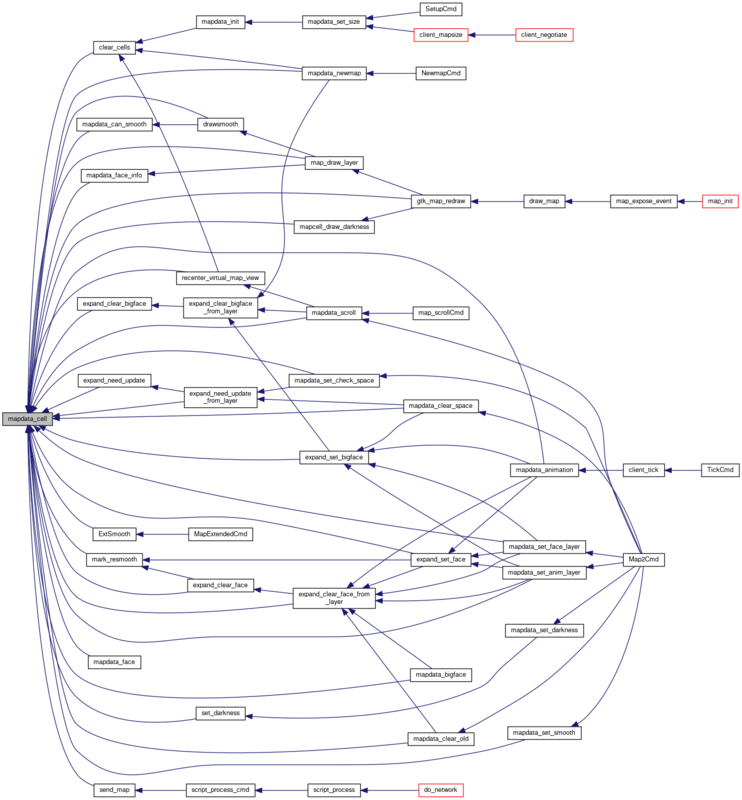 References Map::cells, CFG_DM_SDL, CFG_LT_PIXEL, CFG_LT_PIXEL_BEST, CONFIG_DISPLAYMODE, CONFIG_LIGHTING, MapCell::darkness, MapCell::have_darkness, height, mapdata_cell(), MapCell::need_update, the_map, use_config, width, BigCell::x, and BigCell::y. The variable bigfaces contains information about big faces (faces with a width or height >1). The viewable area bigfaces[0..width-1][0..height-1] is unused. Definition at line 96 of file mapdata.c. Referenced by expand_clear_bigface(), expand_clear_bigface_from_layer(), expand_set_bigface(), mapdata_animation(), mapdata_bigface(), mapdata_bigface_head(), and mapdata_init(). Contains the head of a list of all currently active big faces outside the view area. All entries are part of bigfaces. Definition at line 89 of file mapdata.c. Definition at line 82 of file mapdata.c. Referenced by expand_clear_bigface(), expand_set_bigface(), mapdata_bigface(), mapdata_clear_old(), mapdata_clear_space(), mapdata_face_info(), mapdata_has_tile(), mapdata_init(), mapdata_is_inside(), mapdata_scroll(), mapdata_set_anim_layer(), mapdata_set_check_space(), mapdata_set_darkness(), mapdata_set_face_layer(), mapdata_set_size(), recenter_virtual_map_view(), and set_darkness(). Definition at line 99 of file mapdata.c. Referenced by clear_cells(), expand_clear_bigface(), expand_clear_face(), expand_need_update(), expand_set_bigface(), expand_set_face(), mapdata_animation(), mapdata_bigface(), mapdata_cell(), mapdata_contains(), mapdata_face(), mapdata_face_info(), mapdata_init(), mapdata_scroll(), mapdata_set_smooth(), mapdata_size(), mark_resmooth(), recenter_virtual_map_view(), and set_darkness(). Viewable map size, in number of tiles. Referenced by expand_clear_bigface(), expand_set_bigface(), mapdata_bigface(), mapdata_clear_old(), mapdata_clear_space(), mapdata_face_info(), mapdata_has_tile(), mapdata_init(), mapdata_scroll(), mapdata_set_anim_layer(), mapdata_set_check_space(), mapdata_set_darkness(), mapdata_set_face_layer(), mapdata_set_size(), recenter_virtual_map_view(), and set_darkness().